Based in Bandar Muadzam Shah located in Pahang, this town is the home to travel company Sanwa Tours (M) Sdn Bhd. 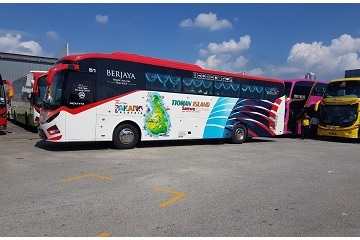 Since Sanwa Tourswas established on 20th December 2012, they have been making quite a name for themselves as an express and tour bus provider for many travellers all over the places, especially those in Pahang. From the beautiful rainforest of Taman Negara to amazing beaches at Langkawi, Pahang has so much to offer to people with different interests. 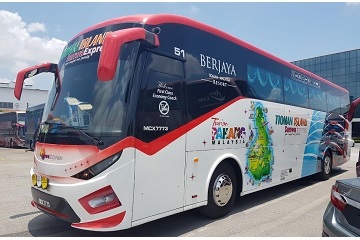 Just like the selection of destinations that is provided by the bus company, Sanwa Tours bus tickets are available at Easybook for your convenience whether you want to travel to and from Pahang all the way to Singapore. 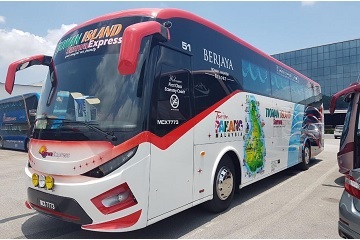 Besides helping to elevate the tourism industry in Malaysia, Sanwa Tours also created Sanwa Express which includes operations for express bus, tour bus, transit bus and even school bus. This has allowed Sanwa Express bus to become quite a prominent figure within the transportation line by catering to people from all walks of life.Sticking to their slogan of "Your Comfort Our Priority." Sanwa Express Malaysia continues to upkeep their services by making sure their passengers are getting the best treatments that they can offer with the bus rides. You will be able to find Sanwa Tours vehicles to be available in single decks of 44 seaters with 2+2 arrangement. Most of the coaches come equipped with Wi-Fi service to allow you to be connected to the internet on-the-go. There are also charging ports on the bus which makes it super useful if you didn't have time to charge your devices. No more worrying about being on low battery upon reaching your destination with Sanwa Express bus! Besides having air-conditioned coaches with spacious legroom and reclining seats, the company makes sure your bus ticket purchase is worth your money. 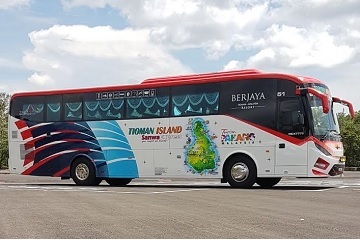 One of Sanwa Express Malaysia's most popular routes would be from Terminal Bersepadu Selatan (TBS) in Kuala Lumpur going to Tanjung Gemok Jetty, which is the drop-off point that will take you to Langkawi Island. Muadzam Shah Bus Terminal is without a doubt a popular spot when travelling with Sanwa Tours as this is the pick-up point from Pahang to your desired destination from having a quick getaway atprivate accommodation Awanmulan in Seremban to exploring some of the tastiest food available in Klang. With reasonable fares being offered by Sanwa Express bus, anyone can travel with them these days especially for students at Maktab Rendah Sains MARA Muadzam Shah, Politeknik Muadzam Shah and Universiti Tenaga Nasional (UNITEN) to return to their respective hometowns without breaking a wallet.Make sure you book your bus ticket online with Easybook the next time you are travelling within Malaysia and Singapore at the comfort of your own space. You can also download our mobile app for free to your devices so you can buy them at your own convenience.